ABSTRACT: Reticulofenestra circus var. lata is described from the Early Oligocene of North Atlantic Deep Sea Drilling Project (DSDP) Site 558. The taxon is a large variety of Reticulofenestra circus, a medium-sized subcircular reticulofenestrid (8-10 micron in size). The outline of the new variety and the shape of the central area are identical to those of R. circus.Nonetheless it can be easily differentiated with the light microscope by the thicker collar and the considerable larger size (12-14Âµm) of the coccolith. The quantitative distribution pattern shows that the taxon has a shorter stratigraphic range compared to that of R. circus, ranging from the uppermost part of Zone NP22 to the lower part of Zone NP23, within Chron C12r. The ages of the FO and of the LO of Reticulofenestra circus var. lata at Site 558 have been estimated at 32.46 and 31.71 Ma respectively, based on the available magnetostratigraphy. The LO is located slightly below the LO of Sphenolithus akropodus,whose biochronological age has been here calculated at 31.31 Ma. Reticulofenestra circus var. 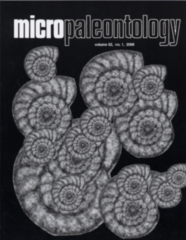 lata may represent a new Early Oligocene biostratigraphic marker.